How do we come up with the novel products we offer to the fly fisher? We get asked that question from time to time. 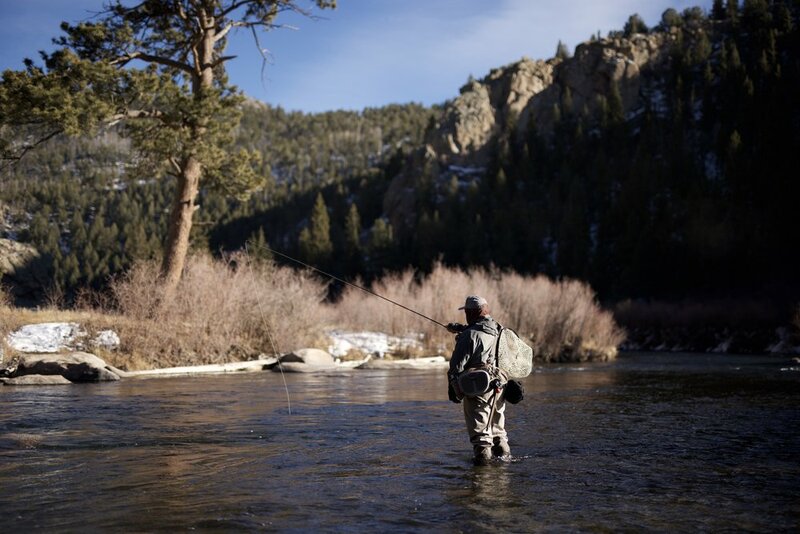 Simple answer - we fly fish…a lot. We’re also inventors, minimalists, and perfectionists with true passion for fly fishing. That combination is what drives our ability to come up with simple, elegant solutions for you, a fellow fly fisher. So here’s the story of how we came up with the idea for Tippetac. It was January 2013 and we were fishing a local Colorado tailwater (South Platte in Eleven Mile Canyon). It was single digits under blue skies. Fishing was slow as is typical that time of year. My cold fingers kept dropping the 7x tippet while trying to tie on various tiny midges. Turns out, all of us were having the same problem. After doing the fly line retrieval dance a dozen or so times and losing flies, I said “there’s got to be a better way.” With the heater cranked up on the drive home, we went back and forth on ideas. By the time we pulled in the driveway, we had crafted the idea for this innovative solution. What we’ve found through many days of field testing Tippetac, is that this little tool is valuable in any situation, not just fishing tailwaters in winter. There’s also seemingly endless uses. Guides love it for many reasons, but one unique reason is that they get “finger stuck” less often. They put the leader in Tippetac before changing a client’s fly. When the client quickly turns to watch a bald eagle soar by and in turn yanks the line, Tippetac holds the leader steady - no hook in the finger. The FRS-9 folding rod sleeve was conceived after years of broken rod tips, rods bouncing around our heads while driving a dirt road, and fumbling around with the various solutions others have come up with to transport a fully rigged fly rod. We found the existing solutions cumbersome, expensive or impractical. No one had yet found the holy grail. It’s an issue that every fly fisher has to deal with, so we put our heads together, and bam…simplicity and elegance. Take a fully rigged rod, fold it in half in seconds, store it almost anywhere. And we just realized that we can store our entire quiver of rods on hangers in the closet, ready to fish! No other product allows you to do that. We’re pretty proud that we came up with it, and stoked that we get to use it too. It was a too cold, early morning to be sitting on a steel bench, but I was loving every second. Coastal fog thickened the air as we pushed up the Alagnak in Katmai National Park, AK. My guide navigated the jetboat with precision through the riffles, around wayward tree trunks and gravel bars. I tucked my chin deep into my coat, trying to find warmth while I peaked forward through my hood, taking in the remoteness of this place. Not another soul around…just me, my guide and a buddy zipping through wilderness. The ride itself was intense with anticipation. We passed seemingly good water at every turn. I had packed along my spey rods and single handers. I was ready for anything and was anxious to cast a fly. Then the scream of the jet motor whirred to a quiet hum as we slowed up around a bend. My guide’s hand shot forward like a hound identifying a pheasant. Looking toward his pointed direction, what I saw made me lose my breath. A grizzly…my first ever grizzly. It was also my first trip to Alaska…a once in a lifetime trip (that I’ve repeated many times since)…and I was in my element. Hard, remote and wild. I had booked the trip with a fly out lodge – nothing fancy, which in my mind makes the experience that much more authentic. The bush plane picked us up in King Salmon…that’s another story of firsts that I’ll perhaps share another day. My guide turned sharply and pulled to a stop on a gravel bar in the middle of the river. The grizzly was creeping along the bank up river not more than 75 yards away…close enough for me to see his beady eyes, dripping snout and massive – I mean MASSIVE – shoulders. I knew we’d see bears. It was July on the Alagnak after all, where thick swarms of pinks (it was an even year, and the humpys run thick on even years in Bristol Bay), sockeyes, silvers and chum filled the rivers of the Bristol Bay drainage. Planning ahead, I had brought my big, 400mm zoom and a tripod. I quickly pulled my gear from my pack and assembled the pieces in a bit of a panic with shaky hands. I jumped out of the boat and tucked behind some thin scrub on the bar, as if it would provide me some visual protection between me and this powerful animal. My heart was racing and I could feel my warm breath pounding against the camera body as I clicked off hundreds of photos as he dug the shallows along the bank for a meal. Each time he glanced my way, I lost my breath again. That experience lasted all but 10 minutes before the bear wandered back into the thick tundra. But I’ll never forget the intense feeling of seeing my first griz up close and personal. I’ve seen seemingly a hundred grizzlies since then, and even today the sense of awe and appreciation is mesmerizing. I hope you enjoy these photos of that first, memorable moment.